I bought Max Factor Facefinity Compact foundation on a whim as it was being promoted near the till in Superdrug for £9.99 (I think RRP is £10.99). 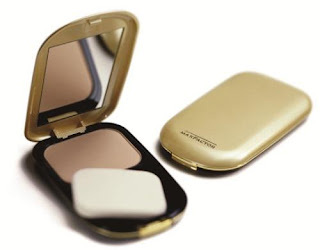 I am quite into powder foundations at the moment as they are quick to apply and I don’t have a lot – or really any – time to put my face on before leaving the house these days. And this one is a compact with a sponge and mirror so no need for additional brushes. I really like this product and want to just say that out of the gate. It goes on smoothly, gives great coverage that you can build up where it’s needed, and the finished outcome is a glowing even complexion. Above all it takes seconds to apply so I am keeping it by the hallway mirror for quick application before leaving the house. But the problem I’ve got is that the shades available are quite dark and so I’ve bought two so far that aren’t suitable, at least for my winter skin tone. I’ve seen about 6 shades of this. Porcelain, Ivory, Natural, Sand, Golden and Toffee. The first one I bought was Natural. There were no Ivory or Porcelain ones left so I just grabbed this one thinking it would be in the right ball park at least. But it turned out to be quite dark. The sort of thing I would use after a two week sunshine holiday to make my face match my body (I am never able to get a good tan on my face, just a bunch of annoying freckles). But I liked the product so I thought I would save that one for holidays and buy a lighter shade for normal use. I don’t have porcelain skin by any stretch of the imagination, so I bought Ivory. But once I tried this one at home, it is also too dark. In fact it isn’t much different to the Natural one and definitely not what I would describe as Ivory. So I’m a bit annoyed, mostly with myself! But is everyone so permatanned these days that foundation shades are overall getting darker? I want to get the Ivory one but I’m reluctant to invest more money in another shade if it's not going to be right. But I do really like this product. Maybe I’ll have to invest in some fake tan instead!